Dandelion – Weed or Wonder? Steep the plant for a refreshing, detoxifying tea. Make an energizing breakfast smoothie. Add the leaves to salad greens for an impressive vitamin boost. Make a soothing cream soup, or boil the roots to create a supportive liver tonic. Any way you pull it, this misunderstood and unwelcome harbinger of spring packs a punch when it comes to overall health benefits. A flowering herbaceous perennial native to Europe and Asia and believed to have evolved roughly thirty million years ago, the dandelion (Taraxacum officinale) was introduced to North America by early colonists in the 1700s. Quickly acknowledged by the native people as a beneficial herb, the dandelion has been utilized since that time for both its medicinal and nutritional benefits. The Greek botanical taraxacum, meaning, “remedy for disorders” indicates that the dandelion has a long history as a beneficial plant, and the designation “officinale” refers to its value as a recognized medicinal herbal remedy. Common folklore names include Irish daisy, blow ball, bitterwort, wild endive and pissabed, the latter likely due to its diuretic properties. The name “dandelion” is derived from the French “dent de lion” – tooth of the lion, referring to the irregular, jagged tooth-like edges along the plant leaf. The dandelion leaves are basal (sprouting from the base of the plant) and grow 5 to 40 cm long. The longest blooming of any perennial, the round, bright yellow flower is comprised of hundreds of small florets to create one single flower head, which sits atop a hollow, leafless stem that can grow from 10 to 20 cm high. 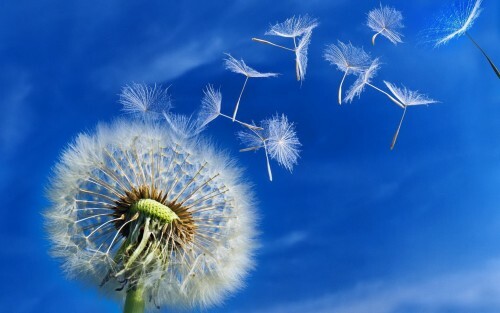 As the flower fades, the dandelion develops a round seed head, complete with white, feather-like tufts to carry the more than 200 seeds per head along with the wind to a new home. The fleshy taproot grows up to 45 cm deep into the ground, helping to aerate the soil and bring nutrients up to surrounding vegetation. Fast-growing, adaptable and very hardy, the dandelion will sprout in any soil type, in full sun to part shade, in any hardiness zone except those with temperature extremes. Reproduction is by seed only. The dandelion has more nutritional and medicinal uses than any other common garden weed, and the entire plant contributes to both. Nutritionally, dandelion greens are high in vitamins A, B and C, protein, omega 3 fatty acids and iron, and also contain potassium, calcium, magnesium, zinc and fibre. Medicinally, the roots can be boiled and the broth used as a drink or tincture to aid in the cure of liver infections and kidney stones, and the juice taken from the stem and leaves can remove warts, reduce calluses and relieve sores. The plant, when eaten helps to cleanse and detoxify and has strong diuretic properties. The leaves, when cooked help to treat various skin conditions including acne and eczema, and the entire plant contains antioxidant properties and helps boost the immune system. Not a single part of the dandelion goes to waste. With all this in mind one cannot help but wonder why the dandelion is tops on the most loathed garden weed list, rather than revered for the truly beneficial herb and stunning summer flower that it is. Gardeners yearn for blooms that show their brilliant shades for weeks – the dandelion does just that. The deep taproot aerates the soil and the flowers feed bees. Consumer’s travel to the store to pay for healthy greens that Mother Nature delivers, and millions take medications that could be replaced by dandelion roots, leaves or stems. If dandelions were endangered, would we show this plant more respect and embrace its benefits, enjoying the long-lasting blooms and health offerings provided? If it were a pricey restaurant entree, would we rethink the never-ending spring weeding rituals and stop looking for effective, but dangerous herbicides? Would the perfect lawn continue to be a priority, or would we realize we have a free and delicious source of optimal health right at our fingertips? Perhaps then, we might also recall the fun of this much-loved childhood plant and instead of attempting to destroy it, pick up the round, puffy seed heads, blow them onward, and make a wish for more!